Are you plagued by morning sneezing fits? Chief Medical Officer at the American Cancer Society tells CNN the likely cause is related to your sleeping environment. Your pillow or bedding may be the issue. If you live in a particularly dry climate or keep your air conditioning very cold, your nose may be reacting to the change in the air. You may also be reacting to dust mite, mold, or animal hair, says Health Hype. 1. Turmeric. 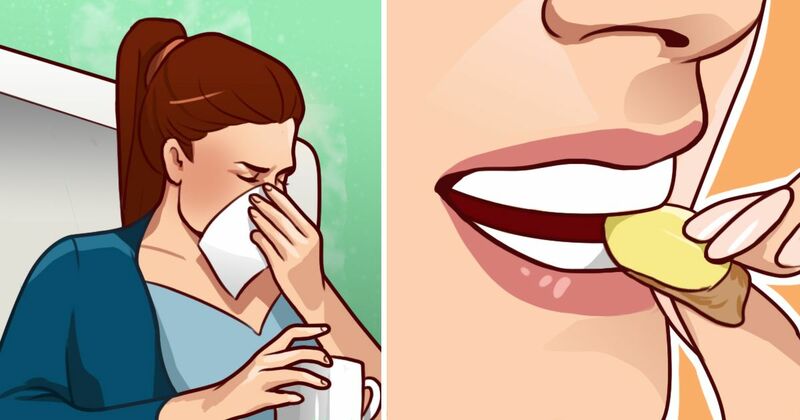 This home remedy from Easy Ayurvedic is designed specifically for morning sneezing. Sprinkle 1- 2 spoons of turmeric powder in a pan over high heat. Inhale the fumes first thing in the morning and then 2- 3 more times throughout the day. 2. Black pepper, pepper leaf, turmeric. Wrap 5- 8 pepper seeds and a pinch of turmeric powder in a pepper leaf. Lightly heat and then chew after brushing your teeth, recommends Easy Ayurvedic. 3. Fennel tea. Bold Sky suggests drinking antiviral and antibacterial fennel tea to develop resistance against allergies that cause morning sneezing. 4. Ginger. Chew on a small piece of antioxidant and anti-inflammatory ginger to alleviate coughing, as recommended by Bold Sky. 5. Garlic, clove. Regularly inhaling a paste made from antibacterial and antiviral garlic and antimicrobial clove can build resistance to sneezing, says Bold Sky. 6. Chamomile tea. Soothing chamomile is antimicrobial and anti-inflammatory, which is why Bold Sky recommends it for treating both sneezing and coughing. 7. Orange. An infusion of vitamin C can effectively lower the amount of histamine in the body. If your morning sneezing is caused by an allergen, drinking a glass of orange juice or eating an orange with breakfast can treat and prevent morning sneezing, says Beauty Health Tips. 8. Peppermint oil. The antibacterial properties of cooling peppermint oil makes this home remedy effective against sneezing and a stuffy nose. Beauty Health Tips suggests inhaling steam made from boiling two glasses of water treated with 5- 6 drops peppermint oil. What are your favorite home remedies for morning sneezing? Tell us when you SHARE this article on social media!